Guinea pigs like to have places in their cage where they can shelter if they get scared, or simply have some 'alone time' away from their cagemates. A selection of tunnels, tubes, and bridges provide the perfect hideaway, and are also great fun for them to run through and play around. They are an essential addition to any cavy cage. You can buy several different guinea pig tunnels, each with their own features and benefits. Plastic tunnels are popular because they can be easily cleaned, and will generally last a long time. Some are extendable and flexible, allowing them to be bent and stretched to suit the size and shape of your guinea pigs' cage. You can even buy kits with several tunnels which can be joined together in different configurations to keep your guinea pigs on their toes. 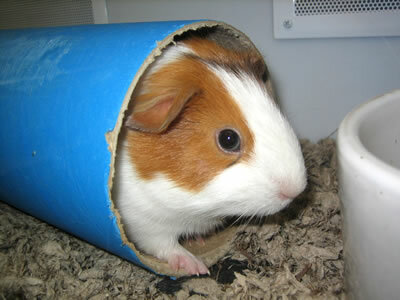 Tunnels and tubes provide a great place for your guinea pigs to hide, and something to keep them entertained. Image by Adrian Scottow. Other tunnels are made from soft materials such as cloth, and often come with a furry lining to make them even more luxurious. Guinea pigs love to snuggle up in these, and can often be found snoozing or even spending the night in them because of the warmth. Perhaps the best tunnels are those made from natural materials like wicker, grass, or hard woods. Not only do these make great hidey-holes and play things, they are also great for chewing on, and will help to keep your guinea pigs' teeth healthy. They won't last forever, as your pets will soon munch their way through them, but it's important that they have something solid to chew on, to keep their teeth short. 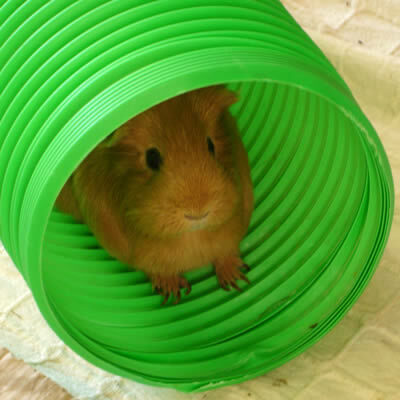 Guinea pig tunnels are available in various different diameters, ranging from about 12-20cm (5-8 inches). Whichever size tube you choose, be sure your pets can crawl through it comfortably without danger of getting stuck. If in doubt go for a slightly larger tunnel to give them more space. Lengthwise, buy a tube that fits comfortably into your cavies' cage, run or playpen. It is usually better to have several shorter tunnels rather than one large one. One or two tunnels are a great addition to your pigs' cage, but be sure that they don't clutter it up too much. Guinea pigs need plenty of empty space to run around and stay fit, so don't be tempted to fill every nook and cranny of their cage with toys and accessories. If your pets' cage doesn't have enough room, save the tubes for use in their larger run or playpen. Wherever you put them, try to secure them so that they don't roll around with your pets inside. The easiest way to do this is to put a pile of hay either side to hold the tunnel in place. These are ideal for helping your guinea pigs get in and out of their cage, for example if they have a run or playpen with their cage inside. This allows them to come and go as they please, so that they can return to the comfort of their home when they are tired from exercising. They can also be put inside their cage to give them something to run over and hide under, making them doubly useful. If you don't want to buy a tunnel or bridge, you can make your own from everyday household items. Simple plumbing pipe makes a good tunnel, and you can join several pieces together using corners and junctions to create a maze that your pets will love. Cardboard poster tubes are great too because they can be cut to any length, and are thick and strong, making a sturdy tunnel. You can even make square tunnels using old cardboard boxes - just cut off the ends and line the floor with hay or newspaper to soak up any urine. You can easily make your own tunnels and tubes out of household materials. Image by Alex Erde. Whichever type you choose, a selection of guinea pig tunnels and bridges are a great addition to any cage or run, providing your pets with fun, exercise, and shelter.